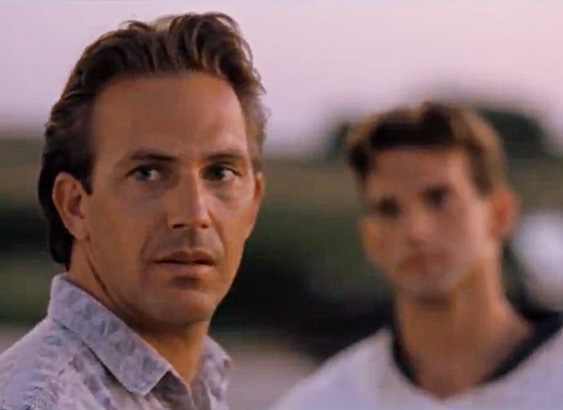 It has been 25 years since actor Kevin Costner graced the screen in the box office smash Field of Dreams. The film starred Kevin Costner, James Earl Jones, Burt Lancaster, Timothy Busfield and a young Ray Liotta as Shoeless Joe. The film’s lead actor Kevin Costner, returned to the Dyersville, Iowa field this past Friday to play a little catch, on the site, with his own sons for the 25th anniversary of the film’s release. Released in 1989, Field of Dreams has gone down in the cinematic annals as one of America’s most beloved sports films. It was nominated for three Academy Awards in 1990. The nominations included one for best picture, one for Screenplay based on material from another medium and one for original score. Costner starred in the film as Ray Kinsella, a simple Iowa corn farmer, and family man who begins to hear clairaudient messages. The first message that Ray hears is, “If you build it he will come.” While Ray is not at first sure, if he is losing his mind, he embarks on a quest to validate what he has been hearing. He ultimately begins to ascertain that the voice is telling him to build a baseball diamond in the middle of his cornfield. The people that come are professional baseball players who have passed on, namely from the old Chicago Black Sox team. They arrive by way of the tall cornstalks and disappear via the same route. Ultimately, the cornstalks produce Kinsella’s deceased father on to the field in a touching reunion scene. Fast-forward 25 years, Costner is now the father of his own two little boys. His son Cayden is seven, and his son Hayes is five. Costner came back to the Iowa baseball diamond for the 25th anniversary of Field of Dreams and took the opportunity to play a little game of catch on the site with his sons Cayden and Hayes. Co-star Timothy Busfield also returned to the site for the two-day anniversary celebration, which brought a few hundred Field of Dreams fans to the location. Costner’s return to the Field of Dreams site for the 25th anniversary is not the only event that has attracted fans. Every year fans of the film trek to Dyersville, Iowa to get a live tour of the iconic location. The Field of Dreams cornfield and baseball diamond is one of the most popular tourist destinations in the state of Iowa. Tourists who visit the site and want to take along an ear of corn are asked to leave a donation. The field is actually situated over the dividing lines of two properties. One portion of the field belongs to Al Ameskamp, and another section belongs to Don Lansing. They’ve successfully coordinated the tourist attraction and work as a team. Kevin Costner is a California native who also garnered fame from yet another baseball themed film, Bull Durham, co-starring Susan Sarandon and Tim Robbins. In 1990, after a number of successful acting roles, Costner moved on to direct a pet project called Dances with Wolves. It garnered Costner an Academy Award for best film and for best director. Costner’s return to the Field of Dreams cornfield for the 25th anniversary serves as testament to his illustrious film career. 4 Responses to "Kevin Costner Back at ‘Field of Dreams’ Site for 25th Anniversary"
Hi there! Quick question that’s completely off topic. Do you know how to make your site mobile friendly? My site looks weird when viewing from my iphone4. I’m trying to find a template or plugin that might be able to correct this problem. If you have any suggestions, please share. Appreciate it! I would like to thnkx for the efforts you’ve put in writing this site. I am hoping the same high-grade website post from you in the upcoming as well. In fact your creative writing abilities has encouraged me to get my own web site now. Really the blogging is spreading its wings quickly. Your write up is a good example of it.